This will be my last post over here and I think we will soon have this one closed down to a redirecting page. So make sure you start following the new blog pretty pretty please. Ok, I’m off now! I can’t wait to see you all on the new blog!!! YAY! I’m popping in today to share my New Year’s Sewing resolution… A Pattern Sew Through!!!!!!! 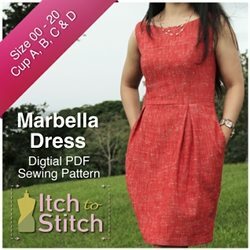 As I was going through my pattern folder on my computer, I noticed that I have a lot of patterns that I have never sewn. So this year is the year. There is 24 patterns in all so my plan is to sew 2 a month. Take a look and check back as I finish the things on my sewing list! So as I mentioned previously, we are moving homes. And I never thought this process would be so stressful! Between packing and going back and forth between towns and setting up a house to sell (not to mention the holiday craziness) we have been pretty much running around like headless chickens for the past month. But on to happy better things. The Ginger House Designs Blog is also moving!! We are going to be self hosted!! The new website will be thegingerhousedesigns.com and will be coming soon! I can’t wait for this change along with all the other things that are going to be coming up for this blog! I’ll keep everyone informed as we go through this process. I hope everyone had a happy holiday! Ours was wonderful and while it was a little sad to see it all end, it is nice to get back to normal (or find a new normal) and get ready for the big changes coming our way!! I have more posts planned for this week so make sure you check back! Have a great Monday!! I’ve realized lately that I am a very functional blog post namer. I try to come up with something cute but I always end up with a name that literally tells what I’m about to do. Oh well! Anyway, welcome to anyone who is here reading for the Sew McCool’s 12 Days of Christmas Holiday Blogger Challenge! In this post, I’m going to show you a fun Christmas tutorial!! How to make slip covers for your couch pillow to add a little hoiday charm to your living room. I guess it would really be adding a little more holiday charm, since, you know, there’s usually a very large tree in the living room also. Anyway, the beautiful thing about slip covers is that you can slide them over whatever pillows you have, without even taken the covers off of the them. Then, when the holidays are over, un-slip cover them and voila! Your couch is back to normal! First, I’m going to go through making a simple slip cover. After that, I’ll show you how I did all the detail pillows! First measure the pillow you are going to cover. The pillow I have here is 16″ x 16″. Now you are going to cut out one square of fabric that is the measurement of your pillow, so 16″ x 16″. For the back, you are going to have to do a little simple math. Because the back is going to over lap in the center, you are going to have to cut two pieces with an added 2″. So first you divide one side in half. Half of 16 is 8. Then you add 2″. So for my pillow we are up to 10″. Here I added 1/2 so I could have a little seam allowance to make a double fold for the open side, so that brings it up to 10 1/2″. That means, my I will cut two 16″ x 10 1/2″ squares. Now you are going to finish the edges of the opening of your over lapping back pieces. On one of the 16″ sides, I fold once by 1/4″ and then again by 1/4″ and then sew down that edge. Repeat with the remaining back piece (in mirror image if you used a fabric with a obvious right and wrong side). Now you are going to lay your square piece down first, with right side up. Then, lay one back panel down (with right side facing the right of pillow front). Align raw edges of panel. The finished edge will be in the center. Lay the other panel on the other side in the same manner, as shown in the picture below. Pin and sew around the outside of the square, about 1/4″ from the edge. Clip your corners and turn right side out and you are done with a basic slip cover!! This is what I used to make the plaid pillow. Cut out the squares as per the basic slip cover instructions. Now cut lots of glitter ribbon to the width of you pillow front. In this case, 16″. Once you have cut enough ribbon to cover the whole pillow front, go to your sewing machine. Lay your first piece right along the raw edge and stitch close to the edge. Overlap your second piece and stitch on the edge of ribbon, making sure to catch the edge of first ribbon in the stitching. I didn’t use any pins during this process, which made it go a lot faster! Continue on with this process until the whole pillow is covered. It doesn’t have to be perfect! I would stop every so often to check if my ribbons were straight. If they were a little off, I would sew the next few leaning the other way to correct it. When your done, you will need to trim the ribbon edges before attaching the back. The picture below is my untrimmed front. Attach the back as the basic instructions say! And done with pillow number two!! Again cut out the pillow pieces out of red fabric as the original instructions say. Lay your front piece out flat. Find the center and make a 2″ wide band on the center front. Use painters tape to mark off the center so you will have a nice clean paint line. Paint inside the lines. Remove the tape before the paint gets to dry so that it doesn’t get stuck. After it’s dry, we are going to make the belt! Once the first two pieces are pinned, cut ribbon to the right length to fill in the sides. I didn’t measure this, I just layed the ribbon in and cut. Pin these pieces in place. Stitch around the inner and outer edges to finish the belt! Now sew the pillow backs to the front, clip corners and turn right side out and you are done again!! And now for my favorite pillow. You are going to cut the pillow pieces out to your pillow size. I did a long pillow on this. I can’t remember exactly but I think it was 8″x13″. Lay out your pillow front. First you are going to pain the whole thing black with the black fabric paint. Then you are going to go back in with the white and whiten some of the areas up (before the black is totally dry) to make it look like the chalkboard has been written on before. Now let this dry. Again, I did 24 hours and this time it might actually take that amount of time since there is a lot of paint. Now I went in with pencil and sketched my “Happy Holiday” design. Remember that it doesn’t have to be perfect. You use your own handwriting on a real chalfboard so use your best handwriting on the pillow and it will look great! Once your pencil sketch is done, take a thin paint brush and white paint and start painting. I actually don’t have any picture of the painting process because it was not very interesting. just me painting over the light pencil drawings I had made. I added dots around the words to look like snow flakes. Then I let this dry. It didn’t take very long, maybe 20 minutes since it wasn’t a thick layer of paint. I then attached the front and back as the original instructions said. Put my pillow in it and DONE!!!! That’s all of the pillows!! Here is a picture of the pillow inside the slip cover. As you can see, I didn’t take the original slip cover off of the pillow. Also, I wrote the dimensions on the pillow inside in permanent marker so that I will know which pillow to put them on next year. That’s all for today! Thank you all for stopping by and I hope you enjoyed this tutorial! Next week, I will be posting the tutorial for Molly’s shirt! To get a better view, check this post out! This post is a part of Sew McCool’s 12 Days of Christmas Holiday Blogger Challenge! You can pop over there and see all of the tutorials and when the blog tour is done, you can vote on your favorite Holiday tutorial! I got really really lucky 🙂 I got to be on the Lil Luxe Pattern Tour! There was only one unlucky part and that was that I had to pick which pattern to sew! I mean really! It was so hard to choose! I can’t say enough good things about this pattern. The instructions were very detailed (it even had directions to make an adjustable waist! That is so wonderful for children who grow up and not out… I know some others out there feel this pain) and the pattern comes together very quickly. I didn’t time myself but I sewed it all in one morning. The pattern pieces went together perfectly. I did make a little mistake and put the skort portions on the wrong way (early morning sewing…) but I added some pleats and I’m still overly happy about the way this one turned out! Besides, even loves to modify a pattern, right? I used a grey quilting cotton with silver designs from Joann’s and I love the way it turned out! It had the right amount of body to really give notice the cool angular edges of the skort. To finish off the look, I appliqued the “Rudolph” head on a t-shirt (more on that soon to come). I think together it looks perfectly “Chirstmas” without beating you over the head with candy canes and trees. Use the coupon code “BLOGTOUR” to get 30% off December 2 through December 11 and click here to enter the Rafflecopter Giveaway! Also, Jess of Lil Luxe will be doing a giveaway once a month starting in January 2015 and all you have to do is follow tag @jessbluxe on instagram with a picture of what you’ve made using your Lil Luxe pattern! Also, check out what everyone else is doing with the patterns by clicking through the links below! I finally get to announce!!! I’ve been dropping hints about something exciting that we have coming up and now it’s time to share!! We are moving!! Ed has been offered a new job and since we had to wait till everything was set in stone before posting it all over the internet, I had to keep quiet. And that’s really hard for me. I’m a bad secret keeper and anyone who knows me knows that! So today I wanted to post a little tribute to where the wonderful place we are leaving. We got married while living here. We got our first furry child, Jane. We had a human baby, Molly. We did things, we met people, we had fun! This town has been good to us and we have enjoyed it immensely! Thanks to everyone who made it special! This is going to be the fastest, pseudo tutorial that you have ever seen! I get piles of hand-me-downs from neighbors and I love it. Some hand-me-downs are for Molly and some for me. I’ve gotten some great things that way! But the things that don’t look good on me or aren’t my style go into the fabric drawers, awaiting new life. And then, one of the sweatshirts finally got it’s new life, as sweat(shirt) pants! The shirt she is wearing with them is a self drafted shirt from the Harry Potter outfit I made back in January. The sleeves are getting a little short now but, hey, they are 3/4 length, right? Lay the sweatshirt out so that the arms are flat and even. I used the already sewn arm sleeves so that the only seam I had to sew was the seat of the pants. Fold the legging pattern (I’m using, as always, the Oliver + S playtime leggings) in half and aline the fold of pattern with the fold of the sleeve (not the fold with the arm seam). Match the bottom sleeve (or take a little off the bottom for a perfect fit since it wont be hemmed at the end). Cut along the outmost lines of the seat of the leggings pattern first, as shown in the picture. Then, carefully, cut the front part of leggings to match your pattern. I eyeballed it and cut as close as possible. Now, cut the back of the legging to match the back of the leggings curve, again eyeballing it to match the back curve as well as possible. Now use this cut out leg as the pattern piece to cut the leg out of the second sleeve. Align the cut out sleeve with the non-cut sleeve, aligning the bottoms and folded edge (you will need to do this one mirror image). Cut the edges to match the top edges (front and back) of the first pair (remembering that it needs to be mirror image). Then finish sewing the leggings as per the instructions, picking up at sewing the seat of the leggings! And on another note: How funny are these pictures? I’ve mentioned before about how difficult Molly can be to take pictures of, or to get to model, I guess and this was no exception. It seems like every photo shoot is full of 2 year old stubbornness. She plays fine until a camera comes out and then suddenly, she needs to be held and wont smile and wont look! So for this one, we just let her play with a kettle full of water and a mug! At least it worked, right? On the Oliver + S blog, they have a series where different people come onto the blog and talk about their favorite sewing pattern from Oliver + S. Well today I wanted to tell you about my favorite pattern from Oliver + S: the Playdate Dress! I think this is my 6th version of this dress, which is the most times I have ever made a pattern (excluding the leggings pattern but that’s a wardrobe basic so of course I would make a lot of those!). I have not posted any of the other version I made (which is shocking to me but I guess that was before I was really blogging a lot) though I did get my favorite version I have ever made posted to flickr. The funny thing about my love for this pattern is that I didn’t pick it out. I was looking for a pattern to buy for Molly’s first Christmas and after buying and failing with a McCall’s pattern (I was just picking sewing back up and didn’t yet have the sewing knowledge to sew the pattern that I choose), I started search the internet for other options. And then I found Oliver + S and began a pattern love affair. I have purchased tons of their patterns and have recieved even more for gifts. Seriously, if anyone is ever in doubt, an Oliver + S pattern is the best gift for me haha. I forget which one I picked out that I originally wanted but I called my husband and told him to look at the patterns and he called back and said he liked the Playdate. I trust his opinion fully, so I bought it. The instructions were great and taught me things while I worked through it. I made one dress and then liked it so much that I made one for my niece and one more for my cousin’s daughter. And then I never stopped making them. I always have a Playdate dress cut out! On this version, the only changes I made where to finish the arms with contrast bias tape and the monogram. I used my sisters embroidery machine. So that it! Does anyone else have a pattern that they really love and sew again and again? I always talk about how much they love each other but I’m pretty sure they love each other more and more everytime they get together! Molly isn’t always the most social little person but Riley has always been one of the few people that she can’t get enough of. Anyway, here are some of our pictures from the day! And here’s Jane. Children make her tired. As I said, my parents went to get a new puppy. He is the cutest. I mean seriously. Look at this little guy!